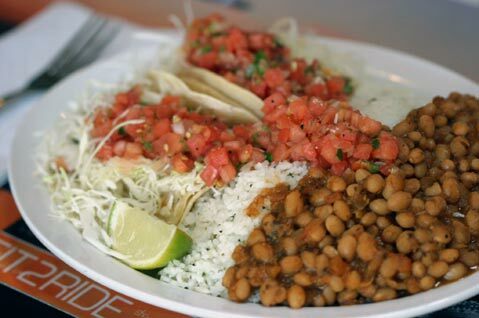 A Review of this "Fine Place to Surf on in for a Tex-Mex Meal"
The dish: Yes, it’s a chain, but individuals own each franchise, and the care shows. Its demographic skews young, or at least wet, what with all the photos of far-too-fit surfers gracing the walls and menu, but anyone who’d like to catch a wave of fine flavor at a fair price should stop in. There are combo platters, there are bowls, there’s plenty of food. But the basic staple that gave the place its name is worthy, a taco made with grilled, tasty ono, a demi-slab of it on each tortilla, redolent of the sea. That sides like ahi rice (named after a pepper, not the tuna) and seemingly from scratch beans also please is a brilliant bonus. There’s beer, too, for tacos without beer leaves this non-surfer bored.